Tuesday Update: Nintendo Stock Down, Kirby Café Open Longer, Super Famicom Mini Arrest, Plus Much More News! (use the code JPNINTENDO for $3 USD off)! ● Nintendo Co., Ltd. stock took another nasty hit in Japan today dropping 5.68% to close trading at 31,220.00. U.S. stock is down 5.89% at press time. ● Sega Games announced the 2D fighting game Blade Arcus Rebellion from Shining for Nintendo Switch and PlayStation 4, releasing on 14 March 2019 and including characters from Shining Blade, Shining Hearts and Shining Resonance Refrain. Teaser scan from tomorrow’s Weekly Famitsu posted here. ● Amazon Japan will be selling a Dairantou Smash Bros. Series 63 amiibo Set from 07 December containing storage box, all 63 released Smash Bros. amiibo (including Inkling, Ridley, Wolf, King K Rool and Piranha Plant) and a wall poster. No price has been announced but the set will be limited to 50. Check out the box/poster here. ● Idea Factory announced that the otomate visual novel Yunohana SpRING！ ～Mellow Times～ for Nintendo Switch will release on 28 February 2019 priced at ¥7,344 or ¥9,504 for a Limited Edition. ● Rainy Frog announced that Piczle Colors will release on the Nintendo Switch eShop worldwide in January. Two new screenshots posted here. ● Level-5 will have a promotion for customers buying Layton’s Mystery Journey: Katrielle to Daifugou no Inbou DX or The Snack World: Trejarers Gold at many game stores from 03 December until 31 January with a mini notebook (for all), ¥30,000 eShop card (3 winners), The Jara Box (50 winners) and Nazotoki Charms (50 winners). Full details posted here. ● G-mode (who have published both Minna De Kuuki Yomi and SpiderSolitaire BLACK for Nintendo Switch) were interviewed by Weekly Famitsu for the 13 December issue where the company talk about a new project. ● The latest Fortnite content update adds the Wild West Limited Time Mode and the new Dynamite weapon. ● Digital Extremes published Warframe in Japan today (21 November), a day late. The game is a free download and requires 12.4 GB. ● Office Create are holding a Japanese 3DS eShop sale from 21 November 21until 05 December with huge savings off the Cooking Mama (and Gardening Mama!) series. ● Animal Crossing: Pocket Camp will celebrate its first anniversary tomorrow (since the worldwide release, Australasian release was earlier) where screenshots posted to Twitter from within the app will see the hashtag #OneYear (#ポケ森1周年 in Japan) automatically change to #MyCampsite (#自慢のキャンプ場) until 26 November. ● Fire Emblem Heroes will see the New Heroes: Fire and Ice summoning focus, Log-In Bonus and Paralogue Story: Whispers of Death in a few hours time featuring Ylgr: Fresh Snowfall and Surtr: Ruler of Flame. Japanese and English trailers posted here. ● Nintendo of America confirmed that a physical version of Travis Strikes Again: No More Heroes will release for Nintendo Switch on 18 January including a Season Pass with more information on the Season Pass coming soon. ● Arc System Works opened up a BLAZBLUE 10th Anniversary website (the series celebrated its 10th birthday today). 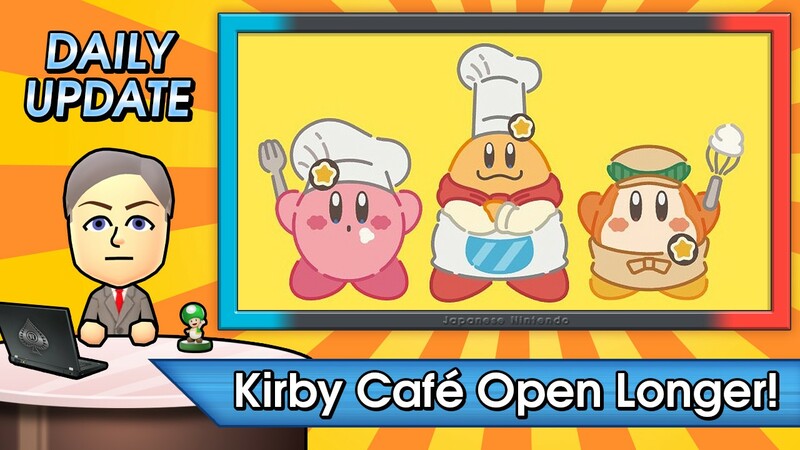 ● The Kirby Café (pictured) in Tokyo SKYTREE TOWN will now close on 02 June 2019 (instead of 17 February). Short clip posted here. ● Tomoyuki Miyamoto (39) from the Ibaraki Prefecture was arrested for violation of the Copyright Act on suspicion of selling three Nintendo Classic Mini: Super Famicom consoles for ¥61,500 each adding five works of a total of four companies including Nintendo’s Super Mario Bros. Miyamoto has been charged with infringing the trademark rights of Nintendo and the copyrights of the four companies (source). ● Watch a seven minute introduction video to Dairantou Smash Bros. SPECIAL (and the English Super Smash Bros. Ultimate here. ● And another brief tutorial video for The Demon Crystal here. ● Thanks to naruki for another couple of news tips again today! ● And thanks everybody for following. Please also follow me on Twitter @japanese3ds and please buy me a coffee! Official Medium account of http://www.japanesenintendo.com covering Nintendo Switch, 3DS, Wii U and Mobile.